WWE is planning to relocate its headquarters in 2021 to the office complex at 677 Washington Blvd., in downtown Stamford, Conn.
STAMFORD — A year ago, the building at 677 Washington Blvd. languished as the city’s largest vacant office property. Today, the outlook looks markedly different for the 700,000-square-foot downtown colossus. The WWE’s announcement this week that it will relocate its headquarters in 2021 from the east side of Stamford to a 415,000-square-foot center at 677 Washington represents one of the city’s largest-ever office deals and the revival of a property rocked by the loss of its longtime tenant, investment-bank UBS. The plan also cements Stamford’s position as arguably the top corporate destination in Connecticut, as the city grows as a hub for media, IT, biotech and consumer-goods companies. When it opened in 1998, the office complex at 677 Washington represented the rise of Stamford as a financial-services nexus between New York City and Boston. Overlooking Interstate 95 and the downtown Metro-North train station, it was originally built to house UBS’ regional headquarters. Next to the property’s 13-story office tower, UBS set up in a seven-story pavilion that would become the world’s largest stock-trading floor. But the post-Great Recession years inflicted a major toll on the company, as it was dogged by scandals and losses. By 2016, UBS had shut down its trading in Stamford and relocated a much-reduced contingent across the street at 600 Washington Blvd., which alo houses the Americas headquarters of the Royal Bank of Scotland. Until recently, RBS had also struggled. It laid off more than 700 Stamford-based employees between 2015 and 2018. In April 2017, a few months after UBS’ last employees exited the building, Beverly Hills-based real estate-investment firm AVG Partners bought the property’s distressed mortgage for $54 million. Its purchase compared with an approximately $146 million loan balance, according to data from mortgage-tracking firm Trepp. The property’s note had fallen into default when it failed to pay off by its maturity date in October 2016. Eight months after snapping up the mortgage, AVG acquired the land of 677 Washington Blvd. for $33 million. In early 2018, Manhattan-based George Comfort & Sons joined AVG on the ownership team, taking on operating and leasing responsibilities for the site. George Comfort owns a number of office complexes in the city, including the Shippan Landing campus and High Ridge Park, next to the Merritt Parkway. In July, the new owners signed their first tenant. 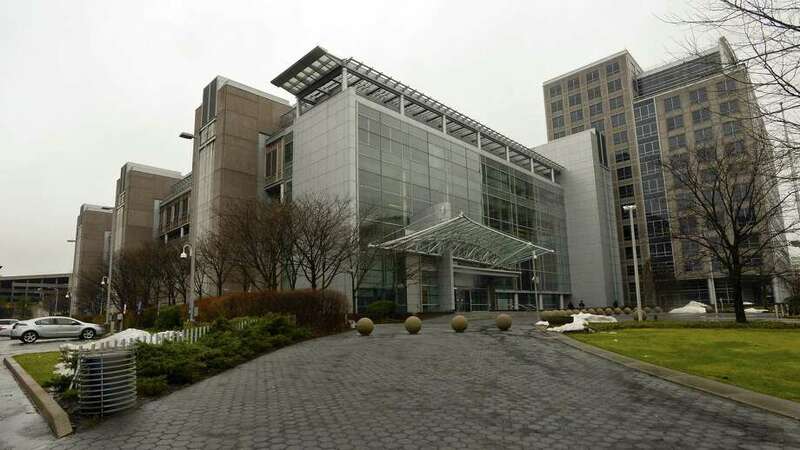 Professional-services firm KPMG plans to relocate its Stamford offices in late spring to 677 Washington, from 3001 Summer St. The company will take about 40,000 square feet at its new address, several commercial real estate firms have reported. In addition, architectural firm Perkins Eastman opened offices around the start of the year, on the building’s ground floor. With the addition of the WWE, 677 Washington is 72 percent leased, according to George Comfort. In the fourth quarter of last year, Stamford’s vacancy rate hovered around 30 percent, as swathes of offices remained open in large buildings such as 677 Washington. With the move, the WWE will consolidate its Stamford operations in one location — and also significantly increase its footprint in the city. At 677 Washington, the WWE will use the entire pavilion for production operations and also occupy four floors in the office tower. Stamford Mayor David Martin said in a statement that he was pleased to see the WWE take advantage of the property’s “gig-speed” fiber-optic internet connections. The WWE now occupies about 92,000 square feet at its main offices in the “Titan Towers” complex that it owns at 1241 E. Main St. Overlooking I-95, the property has served as the WWE’s headquarters since 1990. About 500 employees work there. The company plans to depart and sell 1241 E. Main., leave leased offices at 1266 E. Main St., and “evaluate options” for production studios that it runs at 88 and 120 Hamilton Ave. The WWE’s project adds to a growing list of major companies that are expanding in the city. Down the street from 677 Washington and adjacent to the Metro-North station, cable-and-internet giant Charter Communications is building a new headquarters at 406 Washington Blvd. Originally planned as one 500,000-square-foot building site, the company is now seeking local officials’ permission to construct a second structure on the same property. Last December, job-search firm Indeed announced it will add another 500 jobs in Stamford, following a separate announcement for 500 new positions that was made in July 2017. It is based in downtown offices at 177 Broad St.
To support Indeed’s latest expansion phase, the state Department of Economic and Community Development awarded it a $10 million loan. The firm could also earn up to $5 million in tax credits through DECD’s Urban and Industrial Site Reinvestment Tax Credit program. Other state-backed expansions in Stamford were announced last year by IT consulting and research firm Gartner, professional-services firm PwC, reality-show producer ITV America and genomic-testing firm Sema4. Another state-supported relocation, the move of Henkel’s North American consumer-goods headquarters from Scottsdale, Ariz., to downtown offices at 200 Elm St., marked the city’s largest corporate arrival of 2017.